CAN YOU FEEL IT? It is expected that nearly half of the world’s estimated 10 million species of plants, animals and micro-organisms, as well as humankind, will be destroyed or severely threatened over the next few years. As tribal cultures vanish; through destruction of their environments, through diasporas and through encroachment by western culture, their knowledge is forever lost. 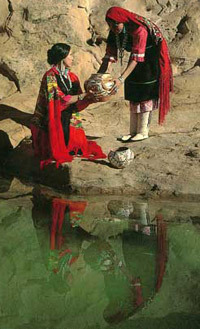 The wisdom of ancient indigenous cultures has allowed them to dwell harmoniously within their native regions for thousands of years. Their knowledge of the biota has contributed to the production of modern pharmaceuticals and to the understanding of animal migrations. Consequences for the loss of this ancient wisdom are incalculable. In these times of dynamic change, when the earth’s resources are diminishing at exponential rates, when the consciousness of man is sensing some innate calling toward spirit, the few remaining, communities still living in a truly sustainable manner on this planet are nearing the top of the endangered species list. The Baka and Maasai of Africa, the Maya and Huichol peoples of Central and South America, Native North Americans, Aboriginal people of Australia, Peoples of the Arctic; all of the ancient indigenous and modern cultures on this planet are threatened with extinction. Join us at The Sacred Earth Foundation as we bring this ancient wisdom forth to teach those of us living in a manner that is not sustainable to walk differently upon Mother Earth, to join in community, to prepare our sanctuaries. Our ancestors are stepping forth in forgiveness and love to show us the way to prepare for the times to come. We bring to you, with great joy, the opportunity to participate in women’s initiations. This commitment by whomever chooses to participate needs to be really clear and we feel it is imperative for each of you to get a taste of what will be ahead. Please join us if you feel called to initiation. This is the story of the message for creating balance on Mother Earth. It is the story of Don Alejandro Cirilo Perez Oxlaj, "The Wandering Wolf." He is a 13th generation Quiche Mayan Priest from Guatemala. He is also the President of the International Council of Mayan Elders. 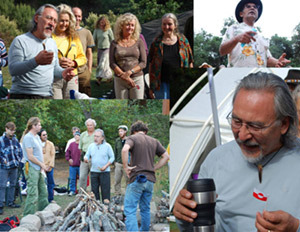 Tierra Sagrada, The Sacred Earth Foundation is witness to a growing community of open hearts. Join us as we continue our journey to a renewed space of hope, joy and wonder. All newcomers are welcome to this experience of transformation in our wisdom, our spirits, and in our community. The time has come to unite our voices and our hearts, to walk our spiritual paths with practical feet, to restore the balance that’s been missing on the earth. We gather together from 9am to 5pm each day surrounded by the glory of Mother Earth for healing and teaching by Angaangaq. 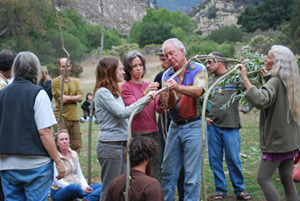 On the second day, we will gather the willows for building our sacred lodge. On Sunday, following the workshop, we will enter the lodge until it ends. This may be as late as midnight. We generally have at least one day in which we welcome father sun at our sunrise ceremony. The time for this will be announced. Once again we are all ecstatic from our recent experience with Angaangaq. 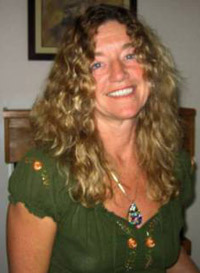 Our very vision of what Shamanic Healing really means has been transformed. We were shifted at the very core of our energy, in our cells, in our perceptions of whom we are. You may find your transformation through the use of the feathers of the Ptarmigan, the power of the Qilaut (wind) drum, or through the breeze from the wing of a swan. Angaangaq is the first man from West Greenland to hold his medicine of the Shaman since 1821. His power, love, compassion and desire to heal the world permeates his very being. ARE YOU READY TO EXPERIENCE THE SACRED JOURNEY OF YOUR LIFE? 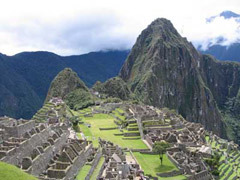 Join Patricia Turner and Alan Leon for a tour of Machu Picchu followed by a trip deep into the Amazon Rain Forest to experience the wisdom of a third generation Shipibo tribal shaman. Alan has organized and led these trips for more than 3 decades and has built an intimate relationship with the native people throughout his journeys. Our visits have been a strong part of recent cultural revitalization as our interest has given the people new pride in their heritage. More than 80 percent of all monies paid to Sacred Heritage remain in the lands we visit and of that, more than 30 percent goes directly, in above average wages, to the more than 100 indigenous villagers and native healers who assist us in our travels. Since the beginning of this service 30 to 50 percent of our profits have been donated to family and community needs, as well as ecologically and economically sustainable village projects. Included in the journey price will be offsets for our travel created carbon. These are positive emissions reductions via funding 3rd world projects of poverty alleviation, health benefits and increased biodiversity. completion of The Sacred Earth Sanctuary.